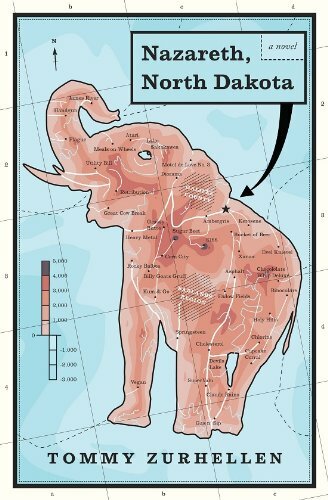 In Nazareth, North Dakota, debut novelist Tommy Zurhellen lovingly reimagines the New Testament as a series of interlocking tales set in the northernmost regions of the American heartland. While the narrative may, on the surface, seem familiar to many, Mr. Zurhellen’s take on the second coming owes as much to contemporary authors like Neil Gaiman and Chuck Palahniuk as it does to Matthew, Mark, Luke, and John. The novel opens with a recovering alcoholic named Roxy doing her best and failing to make amends with her hapless husband, Dill. Diving headlong into an over-chlorinated motel swimming pool, Dill blinds himself just in time to bear witness not only to the dissolution of his marriage but to Roxy’s discovery of an abandoned baby on her doorstep. The child, whom Roxy names Sam, turns out to be the Messiah, and what follows is a series of adventures in which oversexed teens, crooked cops, and a host of small-town saints and sinners stand in for various icons of the New Testament. What marks Mr. Zurhellen as a master storyteller is not his penchant for analogy. Yes, he does a fine job of populating his world with more or less fitting contemporary versions of the Holy Family, John the Baptist, King Herod, Lazarus, and even Salome (cleverly rechristened Sally Mae in this iteration of the so-called greatest story ever told). Mr. Zurhellen, however, has the good sense to play with the archetypes set forth in scripture and, in so doing, breathe new life into what could, in the hands of a lesser writer, turn into a banal if mildly amusing rehash. Among the especially compelling narrative strands in Nazareth, North Dakota are those told from the perspectives of the Bible’s minor characters. Lazarus, for example, takes the form of an ex-con who turns to dealing illegal drugs to cover his medical expenses while King Herod, reincarnated as a “pot-bellied backwater sheriff with no friends and only a hollow shell for a family,” comes off as a sad buffoon struggling to crawl out from under the shadow of an overbearing father. More than just a clever reimagining of the New Testament, Nazareth, North Dakota is an epic tale in its own right. Employing a wide range of narrative voices, Mr. Zurhellen offers a new twist on Christian mythology and, in so doing, demonstrates that while it may be true that there is nothing new under the sun, there’s a good mix of enjoyment and insight to be found in recycling the old.